Boulevard Supply is a supplier of crowd control stanchions, portable signage and traffic control equipment to schools, colleges and universities. Our colored traffic cones and delineators are popular with many colleges for use in their parking lots as they match team colors with our blue or white traffic cones. Some opt to silk screen their team or school logo on the cones. 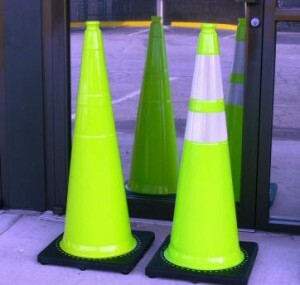 Our reflective lime green traffic cones are ideal for crosswalk areas and bus loading zones. We have portable school zone signs to help keep kids safe in school zone crosswalks and parking lots. All levels of school from grade schools to colleges use retractable stanchions to control the flow of student traffic in their cafeteria lunch lines. We now offer cooking and baking equipment to keep the student bodies full. Keeping student athletes cool and safe during sporting events is extremely important. Our large portable cooling equipment can be found on the sidelines of many high school and college football fields across the USA.